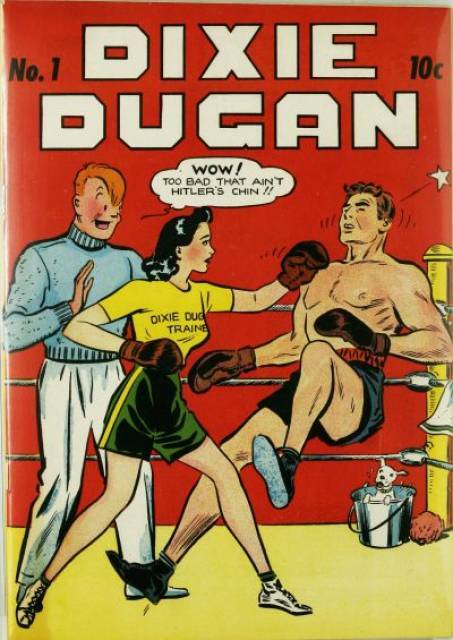 Dixie Dugan, Comic Book #1, Issued July 2, 1942, one of several comic books during the war years that featured women as strong fighters. Hattie Stewart, 1883, published in the National Police Gazette. She was one of two fighters who were known as the Female John L. Sullivan. The other was Hattie Leslie. The process of writing a book is humbling (as in the magnitude of the task), daunting (as in a HUGE undertaking), exciting (researching and finding tiny pearls are truly the cookies), maddening (as in losing my way) and ultimately immensely satisfying with the proviso that you see humbling. Writing a history of women’s boxing which has to be teased out of endless newspaper stories, still images, and bits of surviving slim and distant memories, is particularly so. I worry that I won’t get it right, or in delving into one subject or another, that I’ll be tickling my own fancy to the point where the random reader will exclaim “WTF” never to crack the book open again. Fact checking is also difficult (see daunting), but one does find a rhythm and learns to use phrases such as “it has been said” or “it was dubiously reported” … and so on. What’s extraordinary to me is that women have persevered in a sport that loved to hate them. In the late 1800s to early 1900s, that meant that women didn’t have the chance to fight professionally so they took to the variety theater stage instead. Hattie Stewart was one boxer who plied the boards in the era. She and another fighter named Hattie Leslie were both known as the “Female John L. Sullivan.” The never did meet in combat, though they called each other out in the boxing press. Unfortunately, Hattie Leslie passed away in 1892 from a sudden illness, so the fight of the dualing female Sullivan’s never did happen. It’s also amazing to me that the writer Djuna Barnes penned articles about boxing–both from the point of view of being a spectator (My Sisters and I at the Prizefights) and in two interviews: one with Jess Willard not too long after he defeated Jack Johnson in 1915 (Jess Willard Says Girls Will be Boxing For A Living Soon) and one with Jack Dempsey published in 1921 (Jack Dempsey Welcomes Women Fans). I find I have favorites too among the women I am writing about. Belle Martel, the first female boxing referee, is someone I just adore. She was a vaudvillian who met her husband Art, a former boxer, during her show business career. As the business died out with the advent of Talkies, she and Art settled in Van Nuys, California. He started a gym and began training youngsters how to box. Before long, she was in there with him and the two of them became very well known for the quality of the amateur boxing shows they put on–but really it was all Belle. By 1940 she’d been a trainer, a boxing announcer, a time keeper, and as of April 1940, a duly licensed referee by the state of California Athletic Commission. Unfortunately, the hue and cry among certain folks in the boxing establishment and the press caused the Commission to issue a new rule less than a month later forbidding women from officiating at men’s fights. It was truly a blow to her heart, but she persevered and along with her husband opened the Martell Arena–fondly known as Belle’s Arena. I also love Gussie Freeman (sometime known as Loony) who fought against Hattie Leslie in 1892 shortly before Hattie’s death. They had a four-rounder at a theater on Grand Avenue in Williamsburg, Brooklyn, that was talked about for decades. It was the kind of fight that tall tales were made for. On the first telling Gussie, her blond hair in a tizzy, barely made it into the third round before the fight was called. A second telling had the two of them nearly spent, after going four hard rounds that ended in a draw. And by the next telling–Gussie soundly defeated Hattie in the fourth with a resounding knock out blow! 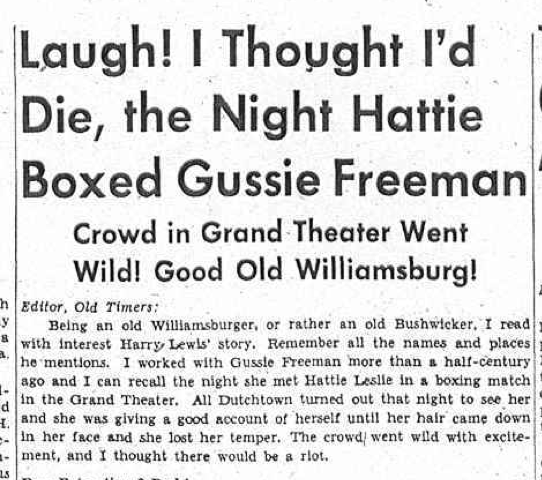 Whatever the real outcome of the bout, it gave Gussie, a rope maker on the docks at Newtown Creek, the chance to travel as far west as Chicago when she signed to fight in Hattie Leslie’s show. Gussie also earned enough money to open a bar for a while, until with the money gone, she went back to the ropewalk. Along the way she made a lot of people smile and fifty years after her fight, it was still fondly remembered. I’ve got a way to go–and a hard deadline coming up, but when I feel overwhelmed by it all, I just think of the sheer nerve of those women and push on. They are truly my heroines–every last one. This is awesome! I love the picture of Hattie Stewart and the snippets of women’s boxing history that you provide here. I look forward to reading your book. Thanks so much. I agree the picture of Hattie Stewart is amazing. I love her intention! She use to fight mostly women, but did fight men occasionally as well! Ever since you started posting the news clippings offering glimpses of the women’s boxing scene in previous centuries I’ve been dying to know the whole story. I want to read this book like crazy.